While man has been filling his cookiewiches with ice cream since the dawn of freezers, the baking brains at Mind Over Batter think you should try another stuffing. 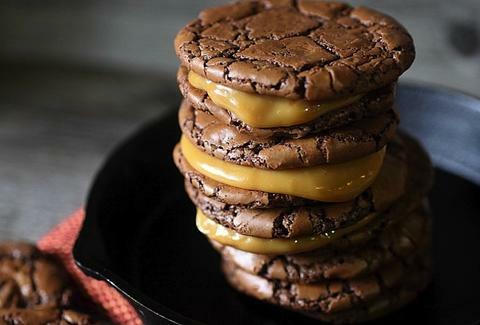 Possibly inspired by this ingenious move, the blog crafted a batch of brownie cookiewiches oozing with dulce de leche that's the perfect warm-up to your impending Thanksgiving gluttony. It's up to you whether you want to make your own dulce de leche or go with a grocery store find, but there's no cutting corners on those brownie cookies. You're going to need a lot of baking essentials (flour, eggs, baking powder, sugar, etc.) along with some cocoa powder and chocolate chips to give those treats a brownie-blasted edge. Once you've mixed and baked everything properly, just plop your dulce de leche on a face-up cookie, sprinkle sea salt, and cover it up with another cookie. Your batch should give you about 25 cookiewiches, which is almost the serving of a standard Oreo package. And just like Oreos, they're bound to give you crippling dependency issues. Kristin Hunt is a Food/Drink staff writer for Thrillist, and just fell in love. Follow her to dulce de leche leftovers at @kristin_hunt.